John Carman, a Republican member of the Atlantic County Board of Chosen Freeholders, a county legislative body in New Jersey, posted a meme on his Facebook page in January making fun of the Women’s March. Ashley Bennett was not amused . . . and so she beat him out of office. By now women should find a sense of humor, right? John Carman, a Republican member of the Atlantic County Board of Chosen Freeholders, a county legislative body in New Jersey, wondered in January 2017 if the millions of women -- accompanied by beyond decent numbers of men -- who attended the Women's March would be home in enough time to cook dinner. New Jersey resident Ashley Bennett was not amused. Bennett, a psychiatric emergency screener, attended the meeting but walked out when she heard Carman’s response. "I walked out because you had the entire time to sit and collect your thoughts, and hear what people were saying, and instead of apologizing and saying you could do better, you disrespect people and say the people you surround yourself are strong," she said at the time. "There are a lot of people who are strong." Adding to Ashley Bennett's irritation was Carman's fashion choice of wearing a confederate flag over his state of New Jersey patch. Other voters agreed. So Bennett -- who had never run for a political office -- ran for Carman's seat and she beat him. The fact that Democratic US Sen. Kirsten Gillibrand from New York read Carman's sexist comments on 'Lovett or Leave It' probably helped her candidacy. But bottom line, Bennett opened up her own vocal box windows and said "I'm not taking this anymore." Bennett was embraced by progressive national groups like Run for Something . “Ashley’s story makes me so damn happy,” tweeted Amanda Litman, a former Hillary Clinton campaign staffer and a Run for Something founder. Producers from the Lawrence O’Donnell show on MSNBC invited Bennett to appear on the show Wednesday night. We'll be tuning in. Tues. Nov. 7: House Democrats Rep. Jackie Speier of Ca. and Michigan's Rep. Brenda Lawrence are championing legislation to curb allegations of sexual harassment in Congress. For Rep. Speier the proposed legislation reflects her long-held commitment to reform of the Congressional compliance office. In a recent interview with Politico, Speier called the OCC "toothless" and "a joke". Politico reports on Tuesday that several women have come forward alleging that Rep. Lawrence, a former harassment complaint investigator for the federal government, has kept her own chief of staff Dwayne Duron Marshall on the payroll, even though multiple women have complained directly to Lawrence. Each believed they made it clear to Lawrence that women in the office did not feel comfortable around Marshall or that he treated women differently than men. Two said they told her Marshall was the reason they were leaving her office. And one said she specifically cited “inappropriate” comments and physical contact. While acknowledging changes she's made in her office over the years, Rep. Lawrence is adamant that no one ever told her that Marshall, who remains her chief of staff, was guilty of sexual harassment. The aides, who spoke off the record to Politico, said they did not use the term “sexual harassment”. However, the women insist that their comments and concerns should have raised alarm bells with Lawrence, especially given her professional background. Simply stated, Rep. Lawrence knows the code language as an investigator and circumstances that can easily cloud the reputation of the accusers in America's halls of power. Politico writes that two female lawmakers -- Rep. Jackie Speier (D-Calif) and Rep. Brenda Lawrence (D-Mich.) -- and several congressional staffers will are working on new legislation calling for an overhaul of the Congressional compliance office, in view of the landslide of sexual harassment and sexual assault allegations mounting across media, Hollywood, state politics and just about every American workplace from the New York/DC corridor to California -- with touchdowns also in middle America. The compliance office is today "constructed to protect the institution -- and to impede the victim from getting justice," according to Congresswoman Speier. This is not her first attempt, having introduced the same bill every year since 2014. “There’s no accountability whatsoever,” she said. “It’s rigged in favor of the institution and the members, and we can’t tolerate that.” Politico writes that "each congressional office operates as its own small, tightly controlled fiefdom with its own rules and procedures, which makes it that much harder to come forward. In policies that are difficult to comprehend, before filing a complaint against an alleged perpetrator, victims are required to submit to as long as three months of mandated “counseling" and “mediation,” and a "cooling off period," before filing a complaint against the alleged perpetrator. Welcome to the Dark Ages in the boys club. 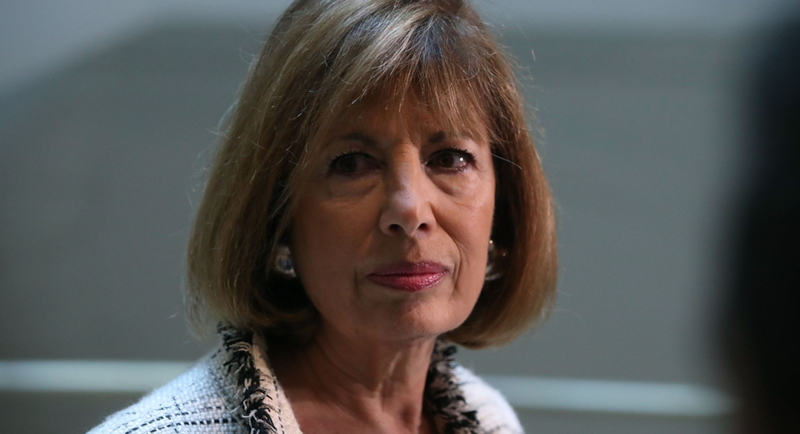 In announcing her new legislation Congresswoman Speier shared her experience years ago as a congressional staff, when the office's chief of staff "held my face, kissed me and stuck his tongue in my mouth." Stay tuned, because this entire conversation should be getting much more attention this time around. Earlier in the week Dem. Women Senators Warren, McCaskill, Heitkamp & Hirono Outline Their #MeToo Stories On 'Meet The Press'.